Two new studies, led by Penn Dental Medicine biochemist Henry Daniell, reveal that enzymes grown in plants can be as effective as the traditional microbial-derived enzyme at accomplishing a number of industrial tasks, from clearing orange pulp from juicing equipment, cleaning laundry stains, removing dye from textiles, or de-pilling fabric. Such plant-grown enzymes have the added benefit of being cheaper to produce and shelf-stable in a powdered form, requiring no refrigeration. In the first study, researchers from Penn used this technique to produce five new plant-derived enzymes, and compared them to 15 other commercial enzyme products that are now derived from microbes, usually yeast. All are commonly used in the textile industry. Many are used in detergents; enzymes such as lipase and mannanase can break down the complex molecules that are present in stains, such as oils, chocolate, and juice. Other enzymes are used to allow fabric to take up or release dye and to avoid fabric "pilling." In comparing the plant-made products to the others, one major difference was staying power. The commercially available enzymes needed to be kept refrigerated, and their activity declined at higher pH or higher temperatures. In contrast, the plant-made products were shelf stable at room temperature for as long as 16 months, and remained effective across a wide range of pH values and temperatures. The Penn team put the enzymes into action in "a head-to-head comparison," Daniell says, testing their ability to remove indigo dye from denim ("biowashing"), de-pill knitted fabric ("biopolishing"), and remove chocolate and mustard-oil stains. In all cases, the corresponding Phyllozyme enzymes achieved comparable—and in some cases better—results than their microbial-produced counterparts. Experiments in the Penn Dental Greenhouse, located at Pennovation Works, and at the hydroponic growing facility Fraunhofer demonstrated that producing enzymes in tobacco or lettuce plants could generate significant yields, and that the resulting enzyme products were effective and active, even when plants were harvested at various time points. In a second paper, which specifically examined pectinases, which are enzymes that break down pectin, a natural component of fruits, an additive to certain foods, and a component of cotton fiber. Juice makers use pectinases to keep their equipment free of pulp build-up. Textile manufacturers use it to break down the coating on cotton that blocks water absorption. Counterintuitively, natural cotton fiber does not absorb water until pectin is removed by enzymes. As in the other study, Penn researchers collaborated with scientists from other institutions to pit plant-derived pectinases against eight commercially available, microbial-produced liquid pectinases. As before, the plant-made enzymes were shelf stable up to 16 months and worked across a wide range of temperature and pH. The liquid pectinases lost activity at higher pH. Using equipment normally leveraged in the textile industry, the Penn-led team showed that the plant-made enzymes could more effectively break down pectin in cotton fabric, allowing water to absorb faster, in a process called bioscouring. This is a necessary step in fabric dyeing as well. They also tested the leaf-derived enzymes in clarifying orange juice, a step that enables the juice to more easily liquify and also releases flavor and nutrients from the fruit's pulp. Here, too, the plant-derived enzymes were equal to if not better than the commercial microbial-derived productions. Daniell notes that a cocktail of different enzymes may allow juice makers to even more fully realize the nutritional benefits of juice, releasing more otherwise indigestible nutrients from the pulp. Daniell is enthusiastic about the potential of these products to reshape industrial processes, particularly because current practices, for example in the textile industry, involve the production of a great deal of chemical pollutants which can harm waterways around textile facilities. Cost and safety are other key issues he hopes this technology can address. "The current technology to produce enzymes hasn't advanced for decades," Daniell says. "There has been no movement on cost, or stability. If we are selling these enzymes to something like a juice company, it would be a huge advantage to have a safe, inexpensive, and shelf-stable product they can turn to as an alternative to currently available enzymes." 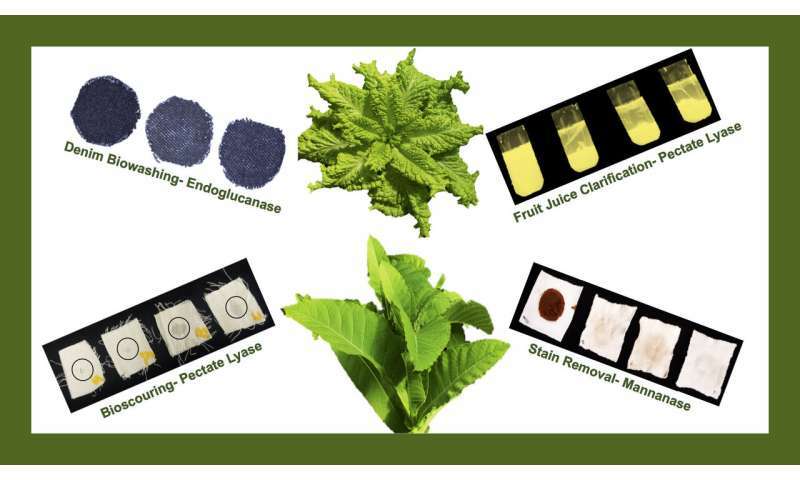 The plant-made enzymes also serve as a milestone in the genetic-engineering field, as the first protein product made in leaves for commercial use. "It's incredible to witness a commercial product that will impact so many people and processes emerging from our school," says Mark Wolff, Morton Amsterdam Dean of Penn Dental Medicine. "Henry is helping chart a path of innovation that I know we'll see many other faculty and students following in the coming years."